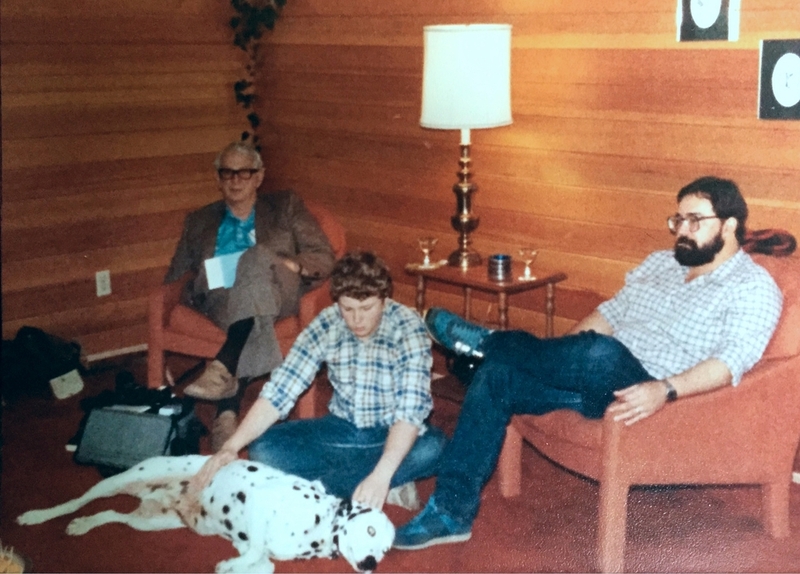 This is a photograph of me, my grandfather, my uncle, and my dog. I have no idea when it was taken, but from the house and my hair I'm guessing it was about 1982. I almost tossed it into another stack of stuff until I realized that everyone in this photograph is dead, but me. This was one of those moments you never plan for, because you can't. It's the kind of awareness that hits you over and over again in middle age. I wish I knew more about Buddhism, because their thinking about impermanence is so valuable, and so much clearer headed about change than my own Christian traditions. In fact, everything in that picture has moved on. My dog went first. I wasn't there. At that time, I was living on an island in the Puget Sound at a YMCA camp. I had a message in my box to call my mother, which I did from the staff phone. I hung up after my mother told me that she found Pongo peacefully curled up in the morning after being mostly miserable for the last few weeks of his life. My step brother buried him in the back yard. I wept openly because no one was there. Eventually a man named Steve Spaulding, who managed the camp, saw me crying and asked what was wrong. I sniffed and wiped my face with the back of my sleeve like a little kid and told him my dog had died. He just looked into the trees, pulled me into his arms and said, "Dammit, Todd. I'm so sorry." Poppa Bob was the next to go. I got the call two years later when I was in graduate school in northern Arizona. My mother said plainly, "Poppa Bob died today, Todd." I remember asking what happened, and she said, "It's taken a long time for him to go, but after we went to see him last Christmas it seems like he felt he could go. Nana says there was a giant double rainbow right over the house. She couldn't see it, but everyone in Chinook did, and it felt like something out of the ordinary was going on." I felt relieved by the news. Poppa Bob had been sick for a decade or more. At one point, early on, he apparently had some kind of heart attack in his chair, and because he was a physician, he got out his own stethoscope, listened to his own heart, and said to himself, "If I call Lucia, they can get an ambulance here, and they can get me to a hospital in Havre and I'll have a 60/40 chance of surviving, but I'll be a mess for the rest of my life. If I do nothing, I'll be dead in an hour." He decided to live out the rest of his years as an invalid. There are very few people left in this world who have the character and skills to make choices like that. Poppa Bob and I spent a day together few months prior to his death, and he went through a lot of old stories about WW II that my mother said he'd never told anyone. He let me go through a bunch of his papers from the military. We laughed a lot. From my position now, I can tell that he knew then that his time was going to come. On the phone, my mother said it would be really difficult to get me to the funeral, and Poppa Bob wouldn't not have wanted me to leave school. Instead I wrote a eulogy and faxed it up to Northern Montana, which my mother read at the service. I was told that there wasn't room for everyone who came. His life and career was an influential part of that section of northern Montana. Someday I need to tell it. A few weeks ago, my Mother sent me a text message about my Uncle Steve, which came during a faculty meeting. Again, the message was plain and unadorned. "Your Uncle Steve died this morning. Details coming." I just sat there, and the words other people were saying broke into pieces and dropped to the floor. My cousin and sister were included in the text message, and their responses buzzed in during the meeting. I don't remember what the meeting was about. Steve had stroke a year ago, and I thought he'd had a second one, but I learned from another text that he died of diverticulitis, which basically meant he'd died from ruptured intestines, which the doctors told my mother might be one of the most painful ways to die. Instead of getting help, he just lay in bed, suffering until he died. Steve's story is complicated and pretty messed up. It's not worth going into, but I was, quite frankly, glad to hear he'd passed. It was really better for everyone. We think he knew he would die if he did nothing, so, like my grandfather (his father-in-law) he made a conscious choice about his life. In this case, he chose to commit suicide over the course of three days. His weapon of choice was a run away infection. All of these thoughts and more broke loose this weekend, when I hovered over this picture. I wondered who in my family would pick up this photograph at some point in the future (I hope decades from now, but who knows) and say to themselves: "Everyone in this photograph is gone." How long before everyone in all of the photographs is gone?